What makes an ideal surveillance drone? To appreciate the answer to this question it is important to first understand what Surveillance is. Security and Surveillance speak to some of the most basic of human needs: safety– how the environment gears up to ensure security, and with that, the safety of individuals. Surveillance is part of a practice commonly referred to as Intelligence, Surveillance and Reconnaissance (ISR). ISR is the coordinated and integrated acquisition, processing and provision of timely, accurate, coherent and assured information and intelligence to support operational decision in a security context. ISR is a variation of Intelligence, Surveillance, Target Acquisition and Reconnaissance (ISTAR). Both of these practices aid in Situational Awareness (SA) and in operational responses to security incidents. They rely on a collection of electronic sensors to be informed which includes alerting, object identification and tracking, situational awareness, and characterization of the operational environment. Wikipedia defines ISR as “a capability for gathering data and information on an object or in an area of interest (AOI) on a persistent, event-driven, or scheduled basis using imagery, signals, and other collection methods”. Generally, this type of surveillance requires an element of stealth or low-noise footprint, to avoid detection as well. Persistenceis further described as “access that provides predictable coverage of an area of interest (AOI). Most space-based intelligence collection capabilities consist of multiple satellites operating in concert, or supplemented by other sensors, when continuous surveillance of an area is desired. Persistent sensors must provide sufficient surveillance revisit timelines to support a security response at any given time”. In military circles, identificationis used along with detection,and recognitionas part of the DRI criteria established by John Johnson. 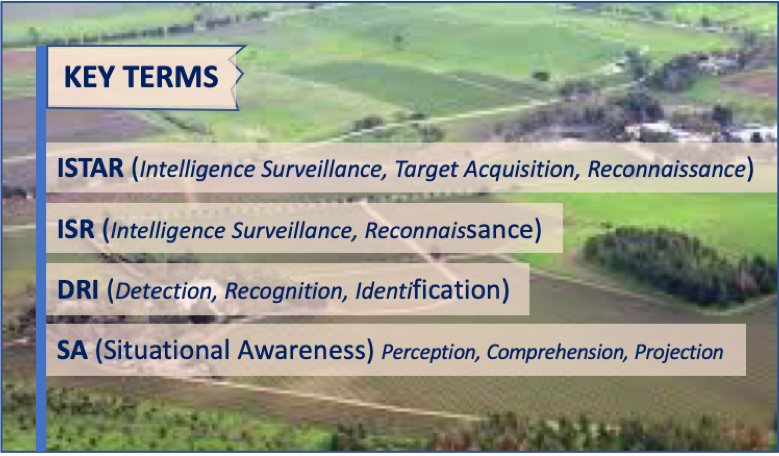 These DRI terms are also used in surveillance applications. Obviously, there will be a trade-off between stealth (distance) and level of detail (proximity) captured, ie. a stronger sensor will allow more stealth (distance) from the Point of Interest (POI). ISTAR is the process of integrating the intelligence process with surveillance, target acquisition and reconnaissance tasks in developing intelligence to improve an operational supervisor’s situational awareness and consequently his/her decision-making. So,what is all this decision-makingduring surveillance activities all about? During security and surveillance operations site supervisors can be more proactive with better levels of understanding gleaned from better insight. Terrestrial, air and space platforms have critical ISR roles in supporting operations in general. By amassing ISR assets, allowing a period of immersion, developing layering and cross-cueing of sensors, an improved clarity and depth of knowledge can be established. ISR encompasses multiple activities related to the planning and operation of systems, that collect, process, and disseminate data in support of current and future security operations. sUAS (Small Unmanned Aircraft Systems), or mini-drones, can be used individually for ISR, or because of its ability to get closer to targets, as a key supplement ISR systems including satellites, manned aircraft, unmanned aircraft systems, other ground-, air-, sea-, or space-based equipment, as well as human intelligence teams. The intelligence data provided by these ISR systems can take many forms, including optical, radar, or infrared images or electronic signals. So, what selection criteria for a surveillance drone can one extract from the operational conditions for surveillance described above? Obviously many ISR operations require a discreet presence and to ability function and monitor without detection. For this, having a rotor design that minimizes noise as well as strong sensor payloads that enable sufficient distance from objects of interest is vital. RECOMMENDATION: Select a UAV (Multi-rotor) which uses large rotor blades that reduce the noise footprint to become indiscernible at, preferably less than, 200 meters. At this distance the drone is hardly visually hardly discernable anyway. Surveillance operations require a level of persistence and for that longer flight times are a priority. RECOMMENDATION:In the multi-rotor market most drones have flight times of less than 30 minutes. Much of this is also consumed by the RTL (Return to Landing) function. To achieve the best out of the sensor payload it is ideal to keep it airborne as long as possible for every flight mission. Flight times should ideally exceed 50 minutes. Satellites and Hale or Male (High or Medium altitude long range) drones lend themselves well to low resolution, scheduled surveillance missions. 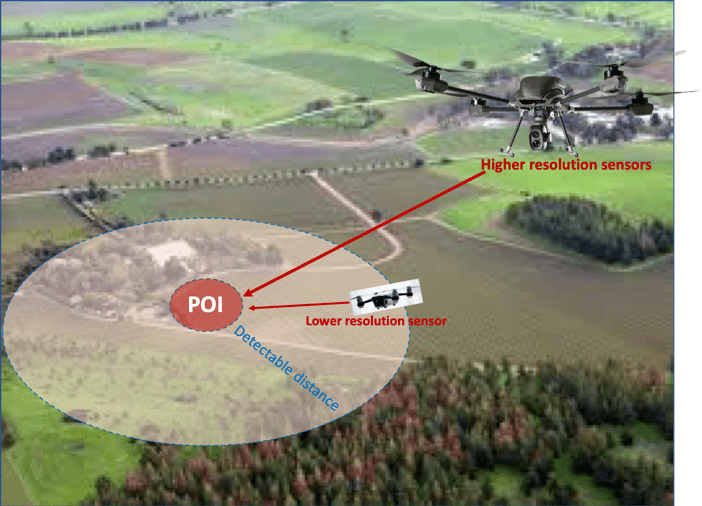 When an event driven response, or the ability to hover around a point (or an area) of interest (POI) is required, the small UAV provides a perfect supplement to other options, especially when a closer level of scrutiny and higher resolution is required. RECOMMENDATION:Long Range Multi-rotor, especially for event driven operations where a POI requires specific scrutiny, but where persistent airborne presence is also required. A high-endurance Multi-copter can also bring more airborne functionality to bear at a POI. In order to keep sufficient distance for discreet surveillance, a large enough payload capacity that can carry sufficiently strong sensors, is required. RECOMMENDATION:Dual sensor payloads and optical and thermal sensors that will meet your DRI (see above) requirements. Consider the anticipated distance from target for avoid detection as per 1) above. Broad and secure bandwidth over an extended range, provides real-time feedback during operational conditions. RECOMMENDATION:If real-time observation and reaction are required objectives in surveillance operations, high-end datalink capabilities are essential. 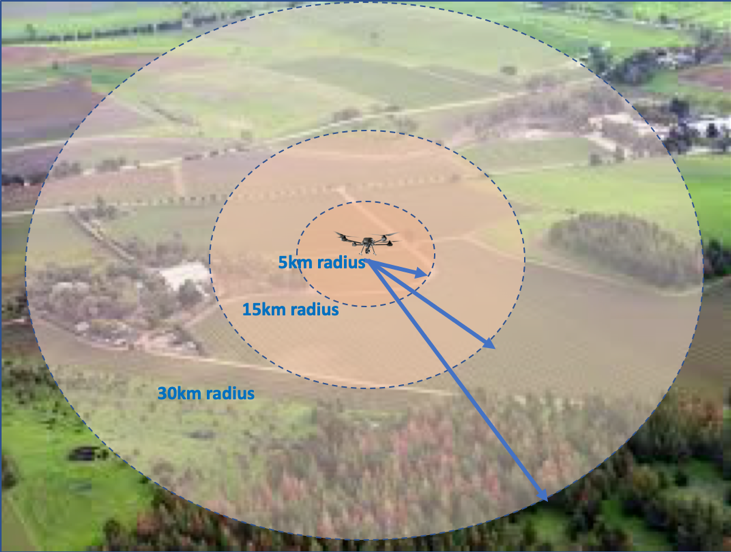 UAV based object-detection and tracking: this capability, especially when paired up with AI, creates a superior ISR solution that is extremely effective in the field. RECOMMENDATION: A UAV platform that integrates object-detection and tracking as a key element in surveillance operations. Criteria extractedfrom typical STAR operations indicate a need for persistent and discreet aerial presence, high payload and connectivity bandwidthalong with the ability to adjust flight paths mid-mission and detect and pursue a target. Long range multi-coptersare an ideal match, either with an extended air, space and terrestrial surveillance infrastructure,or as a standalone solution.